A and R Hoods offers our valued clients in Kent kitchen fire suppression system installation that is in line with the standards of NFPA #96, Ventilation Control and Fire Suppression of commercial cooking operations. Fires in any Kent commercial or industrial kitchen can result in severe destruction to property, environment, business and most importantly, lives. A and R Hoods provides complete kitchen fire suppression system installation services that will greatly reduce the risk of fires in Kent commercial or industrial kitchens. We will conduct an inspection of your kitchen fire suppression system to ensure it is well suited for your Kent establishment. All Kent commercial restaurants deal with range or stove fires with everyday operations and production. An explosion can cause excessive damage not only to the equipment and infrastructure, but also to the environment, employees and Kent customers. A and R Hoods is equipped with more than 25 years of knowledge and experience of kitchen fire suppression system installation for commercial Kent restaurants. We understand the exhaust and ventilation system which enables us to provide fire suppression system installation services effectively. It is mandatory for any Kent restaurant or commercial kitchen to meet the standards of safety and code requirements as per NFPA #96. A and R Hoods provides kitchen fire suppression system installation for safety and code requirements to the Kent community. Kitchen fires are difficult to extinguish and can easily spread into other areas. It your responsibility to provide your Kent business with a safe working environment. Our skilled technicians will ensure that your kitchen fire suppression system is tested and covers all possible areas. 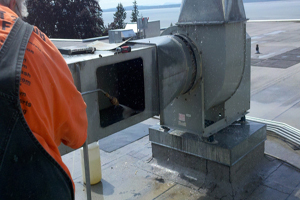 More often than not, fire risk potential is located in the ventilation hood and exhaust ducts. A and R Hoods not only provides hood and duct cleaning services, we also offer restaurant hood and kitchen fire suppression system installation and maintenance. With daily operations, the risk of fire is always a possibility. We make it a priority to install a kitchen fire suppression system in your Kent industrial or commercial kitchen in a safe and efficient way according to set standards. A and R Hoods serves all of Western and Eastern Washington with kitchen fire suppression system installations, repairs and maintenance.